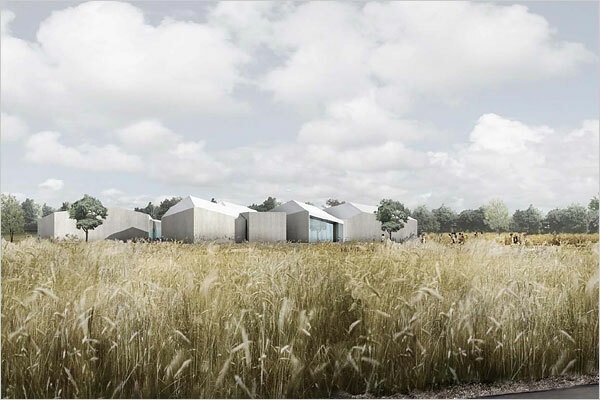 NEW YORK - Since the Parrish Art Museum in Southampton, New York announced recently that it would be expanding, there has been a great deal of anticipation surrounding the plans for the museum's new building. The New York Times reported today that the Swiss firm Herzog & de Meuron, known for Tate Modern in London and the soon-to-open de Young Museum in San Francisco, has been chosen for the project. Although the firm was chosen from among 60 architects, a spokesperson for the Parrish said that the museum is not disclosing the names of the other major contenders. Neither are they releasing any budgetary figures, since the project's financial details are still in the works; a major capital campaign is planned. The 80,000 square foot building will allow the museum to expand its programming with the addition of educational facilities and a theatre, and the building by Herzog + de Meuron promises to attract a larger audience, both nationally and internationally. The new building is scheduled to open in 2009. Commenting on the choice of Herzog & de Meuron, Parrish Director Trudy Kramer said in a statement released to the press, "During our search for an architect to design the new Parrish, we saw the work of more than 60 talented regional, national, and international architects and designers. Ultimately, it was the combination of innovation and tradition, of bold and subtle, that we saw in the work of Herzog & de Meuron, and the fact that each project was unique and attuned to the client's needs, that was so powerful. Additionally, the firm's sensitivity to site, including not only landscape but also light—one of the great qualities of eastern Long Island that has inspired generations of artists—promises to make the design for the new Parrish truly outstanding." A computer-generated image of the proposed Parrish Art Museum. A model for the museum, which was designed by Herzog & de Meuron. ARTISTS have long been drawn to this part of the world by the sharp clarity of the light and the saturated colors of the sky. The Swiss architects Jacques Herzog and Pierre de Meuron set out to capture those local qualities of inspiration in their design for a new Parrish Art Museum here on the eastern end of Long Island. Typically, architects design museums with the art collection in mind; here, the architects also sought to design a museum befitting the artists. The two concepts are in any case intertwined, given that the Parrish’s collection embraces American art from the 19th century to the present day, particularly art created on the island. In preparing to build from the ground up at a former tree nursery just two miles east of the museum’s current home, an Italianate-style building on Job’s Lane, the architects visited studios of artists both living (Chuck Close, Ross Bleckner) and dead (Willem de Kooning, Roy Lichtenstein). In studying their living and working conditions, they gained a sense of how local painters and sculptors became attached to the area. They observed how artists created their studios in former farm buildings, sheds and shacks and oriented those spaces around the northern light. They noted that those work environments were kept open and spare — with white walls and white floors in many cases — and chatted with artists about the nuances of Long Island light. “Every time we came here, there was a different light and different sky, but always amazing,” he said. “It was important to bring that into the gallery spaces.” The architects also met with about 40 artists from the region. Construction of the museum is expected to begin this fall, with a tentative opening date of June 2009. The museum had outgrown its current building, an 1898 brick structure that lacks sufficient space for major exhibitions, storage and educational activities. The architects’ response to the 14-acre site in Water Mill was to spread about 30 modest, low-slung buildings over the area, sandwiched between the Montauk Highway and the Long Island Rail Road tracks. With their varying shapes, angular roofs and local vegetation, the buildings look to be growing out of the ground. The architects sought to strike a balance between honoring the prevailing local aesthetic — wood shingles, brick, farmhouse construction — and creating something strikingly modern. Several different building materials are under consideration, including brick, sand, glass, metal and wood. The rooftops are slanted along the north ridge to bring the sun into the simple boxy galleries. Large skylights afford open upward views and are made of translucent glass to diffuse the light. The parking, arranged in a loop partly submerged in the ground, avoids the feel of a sprawling lot and leaves sight lines unimpeded by cars. Mr. Mergenthaler said the layout was inspired in part by the Louisiana Museum of Modern Art north of Copenhagen, whose buildings are strung out in a verdant park overlooking a sound. “Architecturally, it’s not interesting, but it has a nice feeling because it’s so integrated into the landscape, the way it flows through it,” he said. The architects started with a bubble diagram, a sketch used to propose an arrangement of spaces for a landscape environment or structure, with each bubble representing a component — for example, administration or exhibition. Eventually the bubble diagram became literal, with the new Parrish conceived as a complex of low buildings that flow into one another. “It’s really a loose collection of houses,” Mr. Mergenthaler said. Given the scale and prominence of some of Herzog & de Meuron’s previous projects — the Tate Modern in London (2000); the new de Young Museum in San Francisco, which opened last October; and the Walker Art Center expansion in Minneapolis (April 2005) — the Parrish may seem like small potatoes. Located just off Main Street, the Parrish has been operating in its existing building since its founding by Samuel Longstreth Parrish, a Quaker lawyer and philanthropist. He built it to house his growing holdings of Italian Renaissance art and reproductions of classical Greek and Roman statuary — part of the founding collection, which is owned by the Village of Southampton. Today the collection is dominated by the work of local artists like Mr. Close, Lichtenstein, de Kooning, Jackson Pollock, Lee Krasner, Dan Flavin and Elizabeth Peyton. Ms. Kramer noted that “a huge body” of artists — about 450 — have lived on the East End of Long Island since the 1890’s, a list based on research conducted by young scholars through the Otto Endowment Fund for the Study of Art of Eastern Long Island. To accommodate the museum’s growing collection and big shows, its space will increase to 80,000 square feet — of which 64,000 will be completed by 2009 — from its current 25,000 square feet, which includes an adjacent library on Job’s Lane that will be kept as a satellite. The village is hoping to house another arts group in the old building after the museum moves out, Ms. Kramer said. The Parrish’s operating budget of $3.5 million is expected to rise to $5 million at the new site, she said. She estimated construction costs to be about $55 million to $65 million. A capital campaign will include an endowment drive. The Parrish purchased the Water Mill property a year ago for $3.8 million after an expansion plan for its current site didn’t pan out. The Parrish had big ambitions: it drew up a list of 65 architect candidates before settling on Herzog & de Meuron last summer. Mr. Kramer said she and the trustees particularly admired the firm’s design for the copper-paneled de Young, laid out in three parallel bands intersected by irregular landscaped courtyards, and its penchant for intimate spaces. The museum’s anchoring galleries will feature artists who figure prominently in the collection, like William Merritt Chase, a painter of Impressionist landscapes, portraits and still lifes, and Fairfield Porter, known for his realist depictions of the sea and coastal fields bathed in an unmistakably American light. Envisioning the museum as a social destination for the village, the architects have also included a cafe, movie theater and shop. Mr. Close, the artist, said the new Parrish would give the local art a chance to shine. Pretty nice; like a village in a field. These guys are getting better. This formula works better strewn in a field than stacked in a city. Walker Art Center, in Minneapolis; and the de Young Museum, in San Francisco. carved out of the meadow fabric, past sculptures, to reach the Museum. educational facilities and such public areas as a central lobby, cafeì, and auditorium. A MORE MODEST PROPOSAL Above, a computer rendering of Herzog & de Meuron’s new plan for the Parrish Art Museum. 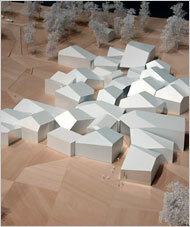 The original design featured a villagelike cluster of pavilions. It was hard to get excited three years ago when the Parrish Art Museum unveiled its plan to build a lavish new home in a meadow in Water Mill, part of the town of Southampton, N.Y. The problem was not with the architecture. The design, a villagelike cluster of pavilions by the Swiss architecture firm Herzog & de Meuron, was perfectly suited to its pastoral setting. Its interlocking galleries made an engaging statement about the bonds among viewer, artist and the art-making process. The issue was location. In the wild days before Bernie Madoff’s fall from grace, the Hamptons had a way of reducing everything to its crassest form. More than likely, the museum would be performing the same function as a Bridgehampton polo match: serving as a place for fashionistas and hedge funders to pass some time before the cocktail hour. Few, surely, would be paying much attention to the art. So when I learned that the museum couldn’t raise the money for the project, and that it was asking the architects for a cheaper, more modest proposal, I wasn’t bothered. True, a spirited design would now never see the light of day. But given the context, wouldn’t a dumb shed — a barn, maybe, or a Quonset hut — serve just as well? And wouldn’t the architects’ considerable talents best be concentrated elsewhere? I was wrong. The new design, budgeted at less than a third of the original $80 million, will be a perfectly nice place to view art — or host a party. Its handsome profile — a long, narrow bar under a corrugated metal roof — has a serene, low-key quality that is a far cry from the ostentatious mansions that defined the Hamptons of the last decade. Yet the design is also a major step down in architectural ambition. And it suggests the possibility of a worrying new development in our time of financial insecurity. It is a creeping conservatism — and aversion to risk — that leaves little room for creative invention. Established at the end of the 19th century, the Parrish was the brainchild of a New York lawyer who wanted to transport some of the exoticism of the Italian Renaissance to this small village built by Puritans. But its vaulted brick entrance ended up looking like a cross between the two cultures. Since then, it has remained a sleepy institution whose principal holdings include realists like Fairfield Porter and William Merritt Chase. Part of Herzog & de Meuron’s task was to shake the museum out of its slumber. The firm began by looking at the studios of some of the area’s most celebrated artists, eventually settling on four models: Porter and Chase’s traditional, salon-style studios; Willem de Kooning’s industrial-looking space; and Roy Lichtenstein’s renovated farm building. The architects then designed abstract versions of these spaces for their new museum. The idea was to preserve the essence of each — the pitch of the roof, the proportion of the room, the position and size of the windows and the quality of light — and use them as anchors for the museum’s other, more generic galleries. The “studio” galleries were then placed around a central lobby, and the others, along with an education building and a cafe, were fit in among them at odd angles, to create a loose-knit conglomeration. The design immediately brought to mind some of Frank Gehry’s revolutionary work from the mid-1980s, in particular the Sirmai-Peterson House in Thousand Oaks, Calif., and the Winton Guest House in Wayzata, Minn.: projects where rooms were treated as discrete objects, suggesting a fragmented community that has been carefully pieced back together. Here the fragmentation emphasized the identities of individual artists — a challenge to the leveling quality of most museum designs. And by replicating the experience of the artist’s studio — without resorting to kitsch literalisms like paint-splattered palettes and dirty brushes — the galleries would also draw the viewer into a more intimate relationship with the making of art. The new design, which was filed with the town’s planning board last week, does have some upsides. Enclosed inside a narrow, one-story structure — 94 feet wide and 634 feet long — the building’s galleries, arranged in two rows along a central corridor, are designed for flexibility, with temporary walls so that the size of the rooms can be adjusted. The building is covered by two parallel pitched roofs — one for each row — with north-facing windows that take full advantage of the soft northern light. The building should also fit sensitively into its surroundings. As you approach by car from the east, you will be able to see just the narrow western end, which will look like twin barns standing in a big meadow. Only as you pull up alongside the museum will you get a true sense of its scale. A deep porch will run the entire length of the building, covered by an overhanging roof. The roof, made of corrugated metal and supported on big wood beams, will be painted soft white, giving it a tough, agri-industrial look in keeping with the area’s history as farmland. It’s the kind of design, in short, that is difficult to object to. And at less than one-third of the cost, no one can complain about the budget. What’s scary is what the design suggests about the future. Is this kind of downscaling the beginning of a trend? Herzog & de Meuron is not the only architecture firm that is being put through this process. Just a few days after I saw the new Parrish design, Rem Koolhaas told me that he was in a similar predicament over a condo and screening room design in Manhattan. It makes you wonder if the cultural consequences of the financial collapse will be as liberating as some have predicted. I’ll be as gleeful as anyone if the excesses and vulgarities of the past decade really do turn out to be over. But it will be a shame if the atmosphere of creative experimentation that coincided with them is over too. 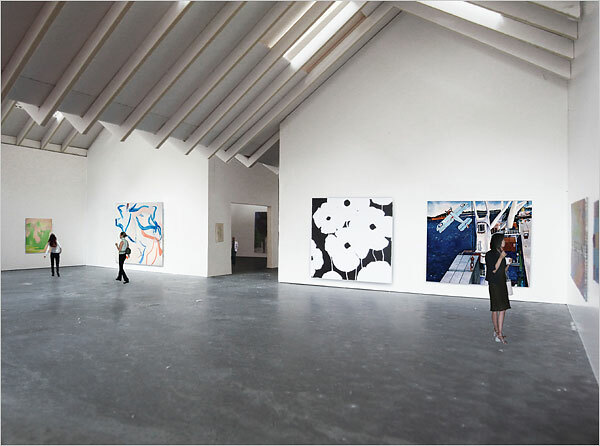 A computer rendering of a gallery in Herzog & de Meuron’s new design for the Parrish Art Museum in Southampton.